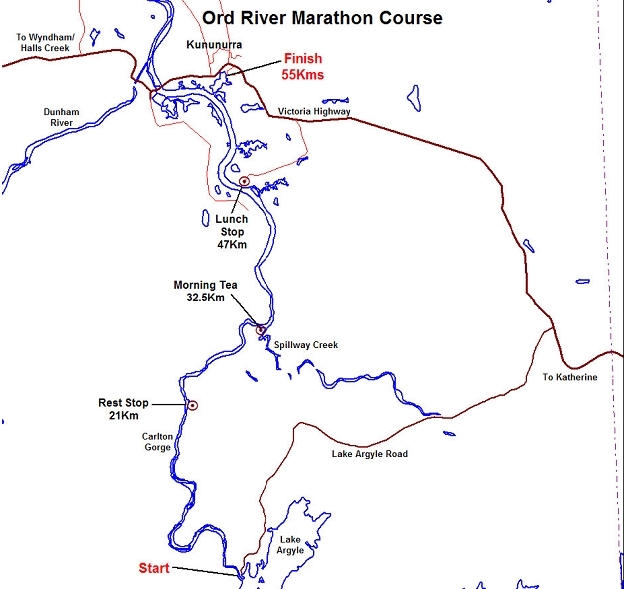 In June 2012 some members of Colour City Dragon Boat Club along with one from Bathurst Pan Dragons travelled to Kununurra for the eighth Ord River Dragons Marathon. 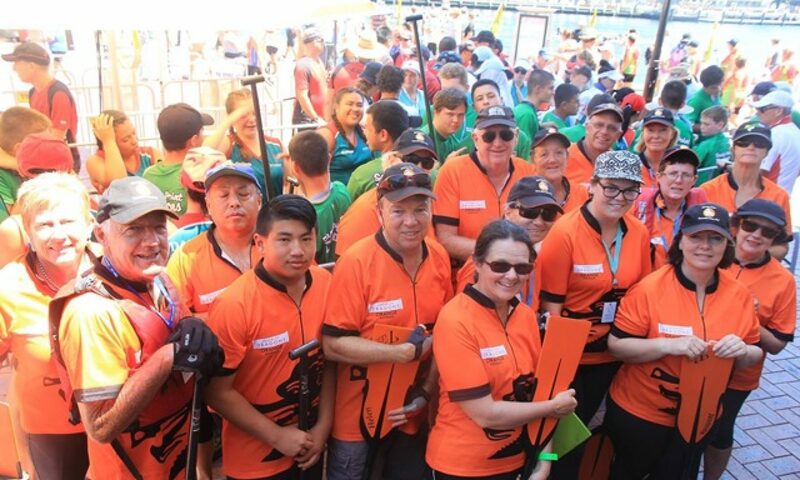 Some of the participants from Orange and Bathurst competed in Darwin the week previously in the Dragons Abreast regatta. This was a great day and they achieved a 1st a 2nd and a 3rd place whilst having a fun day. 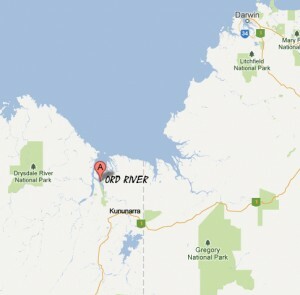 On the 9th June the members had all arrived in Kununurra by various means, some flew to Darwin and hired vans, some flew to Broome and hired vans, one flew to Darwin and then flew to Kununurra, whilst others towed caravans all the way from home. Those towing caravans carried the paddles of some of the ones flying to reduce cabin baggage as you have to supply your own paddle. Drinks and an informal meal were provided at the Pumphouse Restaurant on the night of the 9th. This restaurant juts out over the river giving a spectacular view including a marvelous sunset. Here we met all the participants and had a briefing on the following days itinerary. On the morning of the 10th up early 0400 hours for a 0445 pickup by coach for the 70 Klms trip out to the dam where breakfast was provided at the Lake Argyle Resort. Then down to below the wall where it all begins. There were 7 boats competing in the marathon and although they are capable of carrying 20 paddlers they were restricted to 14 paddlers and one sweep. We had three sweeps who alternated throughout the day. The first stage of the marathon was 21 klms which included “The rapids” fortunately Phil Lambert was our sweep for this part and he handled it with ease. Boy were we ready for a rest stop. The only stop accessible by road is the lunch stop and therefore our supporters (non paddling partners) travelled in a Triple J support tour boat and cheered us on while enjoying the scenery and took all the beautiful photos for us. Powered support boats followed all the way ensuring fluids and energy levels were maintained. At the end of the day a bar b q dinner and drinks was provided along with presentations of shirts, mementoes etc. Following this we were all returned very gratefully by coach to our accommodation. The whole event is a fund raising opportunity for Dragons Abreast and it is very popular and very successful. The results are in… 2nd!! Yes, the team were ecstatic on the afternoon of Sunday the 11th having blitzed their last race with a second placing in the final of the Mixed Sports in the Orange Regatta. None more so than Kristy Sawtell who spent a tiring day as team captain ‘herding cats’, firing up the crews and sorting out administrative issues along with Phil Lambert. It was good to see her jumping for joy at the end. The team were just missing a water cooler to dump on her head in celebration. It was another excellent turnout in Orange by both the club and the community – with 7 schools teams, 12 community teams, and sports teams from 6 clubs. It was a big schedule and a hectic day for officials who had to scratch several races to fit to the tight timeframe. Helen Carey did a lot of drumming and Megan Jones did a lot of sweeping and the crews were grateful for their leadership. And the crews themselves were buzzing at the end of each race: working out techniques, discussing what went wrong with that last run, how can we do better… it is satisfying to see the team coalesce and bond and just work. DBNSW was happy with the event, there was plenty of community support and the mayor and local MP were in attendance. Our regatta was a success.